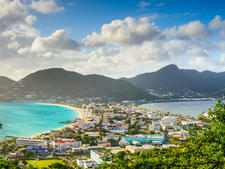 Get beyond that, though, because of all America's Caribbean islands, Puerto Rico offers the most exotic aura. 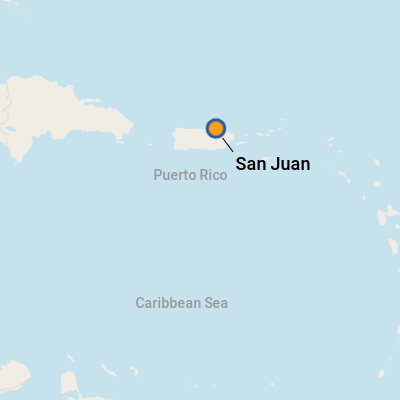 The melange of indigenous Taino culture, combined with European and African influences in San Juan (and all of Puerto Rico, for that matter), is one major factor. Add to that its own unique influences in areas ranging from cuisine and music to history and art. And there's more: folks who have traveled to Cuba say that Old San Juan reminds them more of Cuba, at times, than Cuba itself! It's also very Spanish (think Seville) and even a bit Italian (reminiscent of Naples). Finally, the city evokes just a wee taste of South America (like Buenos Aires). For those who visit San Juan as a day-stop on a Caribbean itinerary or embark or disembark there, the island's biggest appeal is the old city. 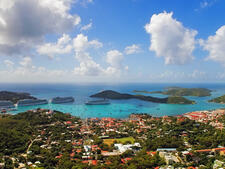 Most cruise ships dock right in the heart of Old San Juan, which dates back to the 16th century. The old, walled city has been exquisitely preserved, and its sprawling forts, cobblestone streets, antique shops and art galleries make it an ideal first stop. Its mainstream attractions include the imposing El Morro fort, which dates back to 1539; the Cathedral of San Juan, where the island's first governor, Ponce de Leon, is buried; La Fortaleza, the oldest governor's mansion on U.S. soil; several colonial plazas; and the triumvirate of Calle del Cristo, Calle San Jose and Calle Fortaleza for shopping. Calle del Cristo, in particular, is chock-full of art galleries, artisan studios and distinctive boutiques. But, if you're a "been there, done that" visitor to Old San Juan, there's much more to explore. And there's one more thing to keep in mind: many cruises stay in port until late at night. That makes it possible to sample some of the city's vibrant restaurants and nightlife (as long as you keep an eye on the clock). 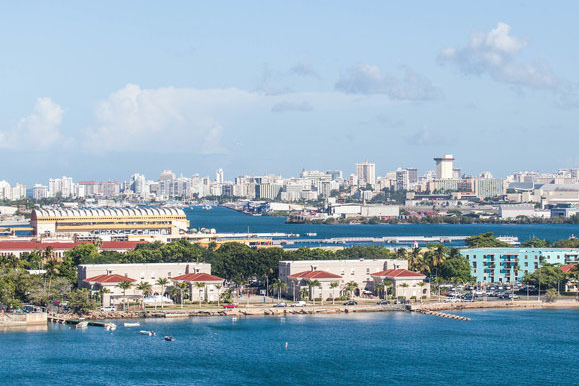 There are two port facilities in San Juan -- one is a 10-minute ride, close to the airport, called the Pan American terminal, while the main cruise terminal (Piers 1, 3 and 4) is just a short walk from downtown Old San Juan. A 10- to 15-minute walk will get you to most restaurants and attractions (about 25 minutes to El Morro). A free trolley is also available from the port to explore the sights. At the terminal itself, local vendors usually set up stands selling knick-knacks as souvenirs. Otherwise, the immediate port area can be very commercial with a mall, ice cream shops and chain stores like Domino's and Senor Frog's. For a more authentic meal, venture into town. Sidewalks in Old San Juan are narrow and uneven. When more than one ship is in town, they're almost impassible. Also, beware that crowds do inspire pickpockets; keep an eye on your wallet. On Foot: It's walking distance into compact, yet fascinating, Old San Juan. Streets are uneven (constructed of blue cobblestones, cast from furnace slag), and hills are steep, so wear comfortable shoes. Taxis: They're available at the dock. You can also hail mini-buses (called "omnibuses"), which shuttle along main routes; to hail one, respond with a wave when the driver toots his horn. Trolleys: There's a free trolley that will take you around Old San Juan and to the forts. You can pick it up across from the information booth, between cruise piers three and four. Renting a Car: There is a Hertz Rent-a-Car in Old San Juan on Calle Brumbaugh, and other agencies in Condado (about 5 miles away) or closer to the airport -- but due to a severe lack of parking around Old San Juan, we don't recommend a car if you're staying in town. Only consider renting a car if you have time on either side of your cruise to explore further into Puerto Rico. Rideshare: Uber is available in San Juan, but not Lyft. It might be easy to find a ride downtown, but be cautious of traveling far outside of the city -- it might be trickier to find a ride back. Since Puerto Rico is an American territory, the currency there is the U.S. dollar. ATMs are widely available throughout Old San Juan and in tourist beach resort areas, and credit cards are accepted at most restaurants and attractions. Spanish and English are the official languages of Puerto Rico. In tourist areas, English predominates. A good spot for a light, healthy lunch or dinner is St. Germain Bistro & Cafe, where you can choose from a selection of sandwiches and salads -- like the Arabian (pesto chicken, grape tomato and hummus on pita bread) or the Ginny (mixed greens, shrimp, carrot, tomato and parmesan cheese with a ginger vinaigrette). Also on the menu are quiche and crepes. The Parrot Club (363 Fortaleza) is the restaurant that inspired San Juan's gourmet revolution, and while it's a bit more passe these days, it's one of the few in the trendy SoFo (south of Fortaleza restaurant district) to open for lunch. It's known for its Nuevo Latino cuisine. Don't miss out on a pina colada from Barrachina (104 Calle Fortaleza), its supposed birthplace. For something a bit more modern, order a house favorite, the lavender mule, at trendy La Factoria on Calle San Sebastian. Medalla Light is the local beer, and while Bacardi is the better-known rum produced in Puerto Rico, the locals prefer Don Q -- an equally (if not more) venerable brand. While San Juan is not a duty-free port, at least its stuff isn't taxed. You'll certainly find plenty of craft and T-shirt shops (particularly along Fortaleza and San Francisco Streets). One tip: the further east you walk (going away from the cruise pier), the more interesting the shops and restaurants become. One great street for window shopping is Calle Cristo; highlights include Magia (99 Calle Cristo), an artisan who crafts works of art from recycled objects -- old mirrors, wooden shutters, antique windows and even pocket-sized religious icons. Prices start at $15 for one-of-a-kind pieces. And, while not exactly exotic, we've had good luck at factory stores for Ralph Lauren, Coach and Gant on Calle Cristo. El Galapon has gorgeous masks. The pocket-sized Plaza Arturo Somohano, just a block behind the Sheraton Old San Juan (located at pier central), is a tree-shaded park that's home to artisans, who sell handmade and designed crafts. They must be approved by the government to open stalls (no "made in China" stuff here). While vendors vary, on my trip, there were beautifully scented soaps from Taino Soapworks (the anise lavender is a favorite), hand-tooled leather belts, pretty (and reasonably priced) beach-glass jewelry, gourds and coconut shells and charming, hand-made, burlap handbags.